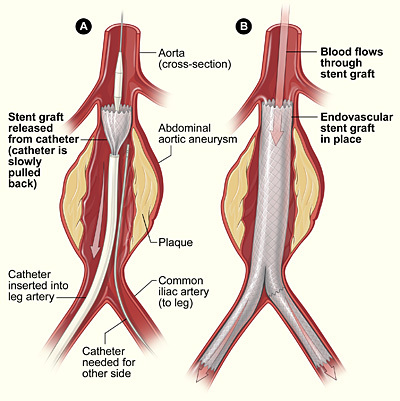 An endovascular abdominal aortic aneurysm repair involves introducing a graft into the aorta via the femoral arteries and fixing a stent across the aneurysm. It creates a seal below the renal arteries, and in the iliac arteries, thus excluding the aneurysmal segment. The consent for Fenestrated EVAR, Branched EVAR, or Chimney EVAR would be the same, however with increased risk of morbidity and mortality, particularly a higher risk of renal failure and bowel ischaemia. Conversion to Open Repair There is an extremely small possibility that the stent cannot pass through the iliac arteries, or that the stent causes the aorta to rupture, necessitating either cessation of the procedure, or conversion to open repair. Nerve Injury The patient may notice a numb patch of skin around or below the groin incision due to damage to superficial nerves. Pain Local anaesthesia will be used in the femoral incisions, however chronic pain from damage to the femoral nerve or its branches is possible. Bleeding There will be a small volume of blood lost during surgery. There is a small chance of bleeding and bruising in the groin post-surgery. Infection Superficial wound infection is possible, however graft infection if occurs is a major complication requiring life-long antibiotics and graft excision if possible. Scarring Groin incisions will result in a scar, which may form a keloid scar, particular in high risk ethnicities. Seroma A swelling of lymphatic fluid may occur in the groin wounds due to disruption of the lymph nodes and channels. Bowel Ischaemia The inferior mesenteric artery is excluded during the procedure. Collateral circulation from the superior mesenteric artery and coeliac axis will usually prevent this complication, however in cases of SMA or coeliac stenosis bowel ischaemia may occur. Migration Movement of the stent downwards thus disrupting the seal zone at the top of the graft, leading to a Type Ia endoleak. Limb occlusion A kink or narrowing in the stent limb can lead to occlusion and acute limb ischaemia, requiring thrombolysis, embolectomy, or a femoro-femoral crossover graft. Reintervention There is a 20% chance of a further operation to repair the endovascular stent-graft. This would be due to any of the complications listed above and is usually performed under local anaesthesia through the groin.